Diabetes (diabetes mellitus) is a chronic, degenerative disease caused by insulin deficiencies due to the body being incapable of producing normal insulin levels, or insulin resistance, a condition in which the cells of the body resist insulin’s attempts at regulating blood sugar levels. Insulin is a hormone produced by the pancreas to metabolize glucose, a form of sugar that is one of the primary sources of cells’ energy supply. Whether diabetes is caused by insulin resistance or a lack of insulin, the end result in the same: the body is unable to transport enough glucose from the bloodstream into the cells, especially after meals, when blood sugar levels rise as a natural consequence of digestion. Normally, blood sugar levels in the body are maintained by the body`s self-regulating mechanisms, known as homeostasis. A rise in blood glucose after eating is supposed to stimulate production of the hormone insulin in the pancreas, and the insulin released into the bloodstream should keep blood sugar levels within a safe and usable range. But when the insulin-producing cells of the pancreas are not functioning normally, glucose levels remain high. If this situation becomes chronic, the stage is set for diabetes to occur. Diabetes affects tens of millions of Americans, and it is estimated that a third of all people who have diabetes are unaware of their condition. Diabetes accounts for nearly ten percent of all U.S. deaths for people 25 and older. It is also the main cause of new cases of blindness among adults 20 to 74 years old, and it is the leading cause of end-stage renal (kidney) disease. In addition, diabetes is the primary reason for amputations of the limb, and is a leading cause of heart disease. Diabetes is generally tested for by measuring the amount of glucose in the bloodstream. There are three types of tests that can be used for this purpose. One is a direct measurement of blood glucose levels after an overnight fast, and the second is a measurement of the body’s ability to handle excess sugar after drinking liquid glucose. 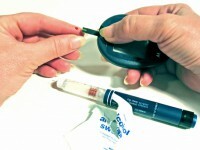 A third test method, the glycosylated haemoglobin A1c (HbA1c) test, measures the number of glucose molecules attached to haemoglobin over a period of two to three months. The conventional “gold standard” for diagnosis of diabetes is a recurring elevated blood sugar level after an overnight fast. A fasting blood sugar value above 126 mg/dl on at least two separate occasions is said to be indicative of diabetes (whereas normal values are between 64 and 110 mg/dl). However, neither glucose metabolism problems, nor the early stages of Type II diabetes can be easily diagnosed without a 4 to 5 hour Glucose Tolerance Test that checks both glucose and insulin levels. The goal of diabetic treatment is to restore near-euglycemia (blood sugar levels close to normal range) and to correct related metabolic disorders. Successful treatment requires diabetics to be actively involved in managing their special dietary and lifestyle needs. While insulin-dependent (Type I) diabetics have to be very diligent in the caring of the disease, we can expect diabetics to be successfully treated with diet, nutrition, stress management, exercise, detoxification, and herbs in about 95 percent of all diabetes cases. There are two main types of diabetes: insulin-dependent juvenile diabetes, or Type I diabetes, and non-insulin dependent diabetes, more commonly known as Type II diabetes. Both Type I and Type II diabetes are characterized by chronic high blood sugar levels, as well as other disturbances in carbohydrate, fat, and protein metabolism. Type II diabetes is by far the most prevalent form of diabetes, accounting for between 90 and 95 percent of all diabetes cases in the United States. People with Type I diabetes do not produce enough insulin, or do not produce any insulin at all in their pancreatic islet cells due to beta cell failure or destruction. In Type I diabetes, blood sugar rises because little or no insulin enters the bloodstream. Because insulin is needed to metabolize the sugars, the body’s cells cannot get the nourishment they need from glucose and the excess glucose just builds up in the bloodstream. Some glucose may be converted into fat, but most spills out into the urine. Type I diabetes usually begins in childhood (juvenile onset), but it may also occur later in life if the pancreas is damaged because of disease or injury. It is conventionally considered a degenerative condition and is treated (but not cured) by conventional physicians by administering insulin injections with every meal to regulate blood sugar. Type II diabetes is much more common than Type I diabetes and is often called “insulin resistance.” In cases of Type II diabetes, the body still produces insulin, but the insulin it produces cannot properly connect with fat and muscles to allow glucose inside the cells to produce energy. According to the World Health Organization (WHO) an epidemic of adult-onset Type II diabetes is occurring around the world. Cases of Type II diabetes are increasing due to factors such as poor diet, obesity, sedentary lifestyles, and longer life spans. Gestational Diabetes is yet a third type of diabetes. It is hormonally-triggered and usually a temporary condition that occurs in pregnant women. Gestational Diabetes is generally a mild condition, and more often than not is manageable through proper diet and exercise. Only rarely does it require insulin injections. Despite its typically temporary nature, gestational diabetes should be carefully addressed because high blood sugar levels can be damaging to the foetus and can impair the baby’s immune defences. Because Type I diabetes is so often due to hereditary factors, it is difficult to take preventive measures, yet there is much that can be done to prevent Type II diabetes, which is by far the most common form of diabetes. Adults who have a high-risk of Type II diabetes can prevent or delay its onset through lifestyle changes that include proper diet, high quality nutritional supplementation, stress reduction, and exercise. Once one’s diet has improved, cleansing and detoxification techniques can be utilized to further improve health. If you have been diagnosed with diabetes, controlling your glucose levels is of primary importance in preventing or delaying complications. You will also need to control high blood pressure and to lower high cholesterol and triglyceride levels. In addition, you should seek alternative professional care for detecting problems in eyes, heart, kidneys, and feet. Proper foot care can reduce amputation rates by 45 percent to 85 percent. And the early detection and treatment of kidney disease can reduce the development of kidney failure from 30 to 70 percent. You also need to learn what constitutes good self-care and practice it diligently. The following natural cure approaches are very important in that regard. Type I diabetes occurs because the pancreatic islet cells do not produce enough insulin, or no insulin at all, due to beta cell failure or destruction. In many cases, this is due to genetic predisposition, since Type I diabetes occurs more frequently among individuals who have inherited the tendency from parents. Many cases of Type I diabetes, however, are due to an autoimmune disease, as shown by the fact that 75 percent of Type I diabetics have antibodies to their own pancreatic cells, whereas only 0.5 percent to 2.0 percent of non-diabetics exhibit these antibodies. Among the factors that can initiate the destructive pancreatic autoimmune process are bacteria infections, especially pertussis (whooping cough), and viruses such as Epstein-Barr (EBV), Coxsackie, cytomegalovirus (CMV), and herpes virus-6, as well as viruses that cause rubella and hepatitis. Bovine protein albumin, a substance contained in cow’s milk, can also trigger insulin-dependent diabetes by provoking an autoimmune response. Albumin antibodies found in some Type I diabetics can interfere with the insulin-producing pancreatic cells. Poor diet, obesity, chronic food allergies, viral infections, chronic stress and genetic factors can all cause or contribute to Type II diabetes, which is primarily characterized by insulin resistance. The more insulin-resistant a person becomes, the more insulin the person`s body manufactures, yet, over time, the body becomes unable to produce enough insulin to make up for the resistance. Sometimes the Type II diabetic’s body will try to compensate, at least initially, by over-producing insulin. But over-production of insulin (a condition known as hyperinsulinemia) can cause damage to blood vessels and can also cause the liver to increase its output of LDL cholesterol, which is linked to the increased risk of heart disease. In recent years, obesity has become one of the most significant causes of Type II diabetes. Today, approximately 85 percent of people diagnosed with Type II diabetes are also excessively overweight. In fact, researchers now say it is basically inevitable that a person who is 30 percent overweight for 30 or more years will develop Type II diabetes. A diet that lacks essential nutrients and is high in sugar or foods that turn into sugar is the other major contributing factor to blood sugar metabolism problems and eventual insulin resistance. This has been documented by international researchers reporting about the increasing incidence of diabetes among populations around the world who adopt a “modern Western” diet high in sugar, carbohydrates, and fat. Poor diet and lack of movement are also two of the primary factors causing excessive weight gain and obesity, further increasing the likelihood of Type II diabetes. This fact gives even more importance to the diet suggestions in the Natural Cures book and makes them well worth the effort. Without changing your diet, given the odds, the risk of diabetes is incredibly high. Other factors that can cause or contribute to the onset of Type II diabetes include viral infections, parasites, food allergies, and hormonal imbalances, including increased levels of adrenaline and cortisol caused by chronic stress. Certain allergies and viral infections can also cause inflammation or autoimmune damage to the insulin-producing pancreatic cells. Higher levels of stress hormones increase the risk of diabetes by stimulating elevated levels of sugar in the blood. Excessive levels of the hormone estrogen also increase insulin resistance. Note: According to Daniel Dunphy, PAC, a holistic health practitioner at the Clear Clinic in Mill Valley, California who has achieved great success in treating diabetes, both Type I and Type II diabetes can often be caused by various harmful microorganisms and/or energetic imbalances that remain undetected by conventional medical testing. Researchers have found that Rooibos – the caffeine-free tea from South Africa – is linked with treatment for diabetes. A national drink in South Africa and very popular for its flavour with South Africans living in the UAE. Rooibos (or red bush, as it’s often known) contains a unique blend of antioxidants which play a major role in boosting the body’s defences. Avoid ALL artificial sweeteners: These include Splenda, Sucralose, NutraSweet or Aspartame, high fructose corn syrup or mono-sodium glutamate (MSG). Avoid all forms of sugar and excessive intake of fruit and fruit juice. Get your 5-a-day primarily from vegetable sources, preferably green vegetables to alkalize your diet. The second best is organic meat; this includes beef, veal, lamb, chicken and turkey. Increase your protein intake especially at breakfast; ideally eat six meals a day making sure protein is included in each meal. Reduce or eliminate your intake of alcohol and caffeine. Eat nuts, seeds, green leafy vegetables and whole grains to ensure your magnesium levels are topped up – magnesium regulates blood glucose levels and studies have shown that a deficiency in this mineral could worsen Type II diabetes. Incorporate chromium rich foods such as broccoli, mushrooms, onions and green beans into your daily diet. In studies where those with Type II diabetes supplemented with chromium, they saw a substantial improvement in their levels of blood glucose and insulin. A diet rich in healthy fats, such as avocados, nuts, seeds, extra virgin olive, raw virgin coconut butter and high lignin flax seed oil also supports you in maintaining level and stable blood sugar levels. In addition, you should increase your fiber intake to a daily level of 40 to 50 grams of fiber, with 10 to 15 grams of soluble fiber. High-fiber foods like beans and whole grains can be added slowly, perhaps at a rate of one serving per week, along with an increase in your intake of pure, filtered water. Take a whole food supplement every day. Food today is not what it used to be in terms of nutritional values. The best we know on the market is Kevin Trudeau’s “KT Daily” product. Take Alpha-Lipoic Acid – It is recognised as a powerful anti-oxidant, which is present in every cell and tissue in the body. Research at the Medical University of Vienna showed that intravenous alpha-lipoic acid treatment increases the width of blood vessels in patients with Type II diabetes. This is of important clinical significance given that one effect of Type II diabetes is narrowing of the blood vessels. Use Apple Cider Vinegar -2 tablespoons of organic apple cider vinegar mixed in a glass of water and taken before meals helps to stabilise blood sugar levels and reduce insulin spikes after eating. What non-prescription and prescription are you taking? Your non-prescription and prescription drugs are partially the reason that you have diabetes. You need to get off these medications but do so only under the guidance of a licensed health care practitioner. Cortisol is an adrenal hormone that is released when a person experiences chronic stress. Increased cortisol slows the metabolism of glucose and therefore is a factor in increased blood glucose levels. Insulin cannot lower the blood sugar when there are excessive cortisol levels in the blood. Alternative and Complementary Diabetes Care. Diana W. Guthrie and Richard Guthrie, M.D. New York: John Wiley and Sons, 2000. Controlling Diabetes Naturally with Chinese Medicine. Lynn M.Kuchinski and Bob Flaws. Boulder, CO: Blue Poppy, 1999.